The Canadian Centre for Accreditation, newly-formed out of six organizations focused on accreditation, contracted Industrial to develop a database application for its public informational website and accreditation system. 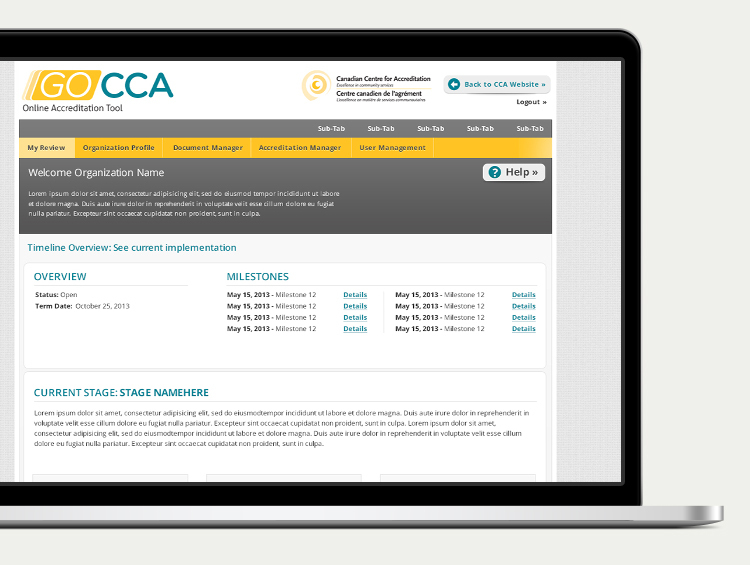 The goal was to provide a straightforward online system to facilitate the accreditation process for CCA and its clients. CCA was transitioning from an existing Microsoft Access database- and email-based system, while at the same time combining the legacy processes of six organizations. Industrial sought to meet this challenge by providing thorough analysis of the business needs and a structured opportunity for CCA to define the new process for accreditation. 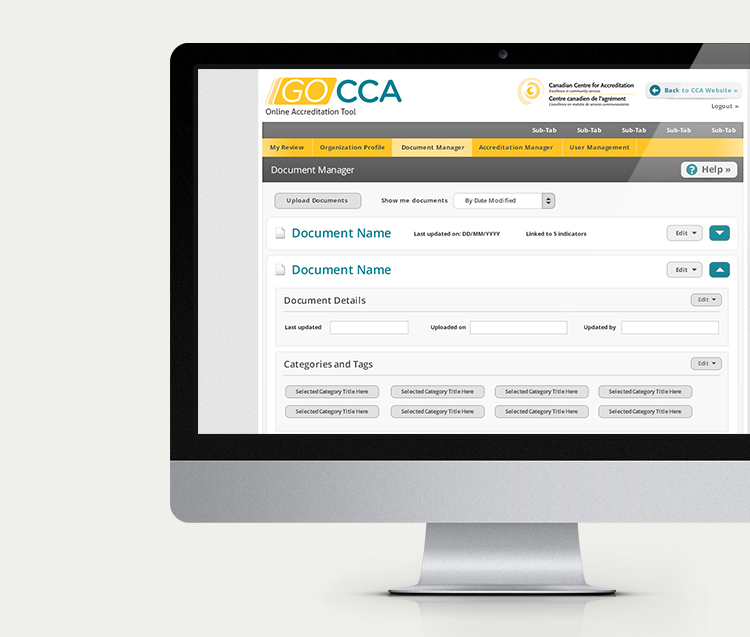 To accommodate CCA’s developing internal processes, Industrial outlined a pilot phase for the GoCCA web application that was based on its legacy system. This provided CCA with a starting point from which to identify new or changed needs for the application. Industrial acted as a partner in defining the business rules for the new accreditation system through several sets of revisions to the system wireframes. As the bigger picture was presented, CCA was able to explore and refine its processes and approach as the application system was developed. All stages of the accreditation process (including information gathering, organization assessment, gathering documentation to meet organizational standards, and reporting) were captured by the online system. Industrial implemented a custom-integrated ASP.NET application that also provides scheduling and messaging services necessary to help lead clients through the accreditation process, and integrated with the Sitefinity Content Management System (CMS). During the pilot release phase of the GoCCA web application, Industrial remained on call to resolve high priority bugs or issues as they were uncovered. Industrial also moved CCA to a more robust hosting server and updated its security and privacy features. Throughout the pilot phase, Industrial gathered feedback on the system from CCA, its users, and our own review, and took this into account in recommending enhancements to the system for a phase two development project. Realizing that CCA’s processes were apt to evolve as the organization continued to use and evaluate the first phase of the GoCCA web application, Industrial put a great deal of thought into the system’s database structure. The result is an accommodating database structure that will more easily allow CCA to make changes to the system in the future. Initially using third-party components in the pilot release phase of the application, Industrial ultimately chose to replace these with some custom coding. We realized that third-party components, while functional, can be difficult to use out of the specific context that they were built for. 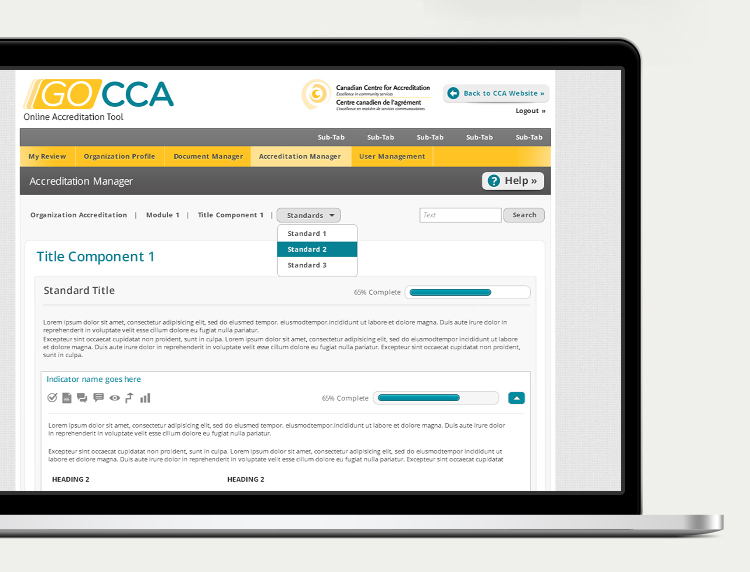 In the CCA application, custom coding replaced the clunky components and as a result made the system simpler and easier to use. Most importantly in this project, working with CCA at every step has allowed Industrial to build a trusted partnership with the organization. Being there as the business rules and processes were developed, we know and understand the implications of potential changes to the GoCCA application, and can better monitor its success to evaluate the need for enhancements in the future. Canadian Centre for Accreditation is a not-for-profit organization offering accreditation for community-based health and social service organizations across Canada.